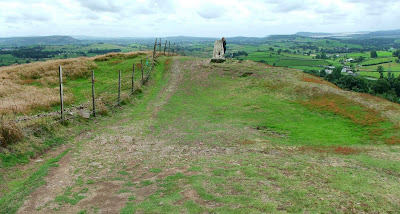 The remains of this multivallate hillfort (a fort with more than one bank and\or ditch) lay 185metres above sea level at the summit of the Helm, 2 miles South of Kendal, and a short walk from the A65. Above. A view along the Helm, looking North East. The hillfort lays at the South end of the Helm, and is easily accessable by foot from the road below it. The remains probably represent an Iron Age hillfort, with the Northern end of the site protected by two ramparts. These have been created by cutting a ditch into the rock across the line of the ridge. To the East of the field wall that bisects the fort, a rough outer ditch can still be seen. Above. 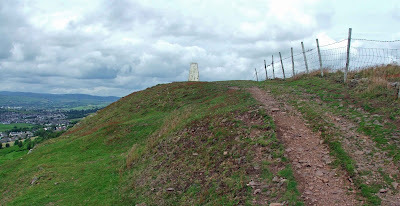 A view of the flat topped summit of the hill fort with the trig point. The inner rampart carries right along the Western side of the enclosure, although here there is no ditch. This side of the fort is protected by the naturally occuring cliff. Above. The inner rampart . This could represent the footings or foundations of a wall. The Eastern side of the fort has lost its ditch, possibly through erosion and soil slippage. However, this side of the fort is still fairly steep, so a ditch may not have been necessary. Above. A view of the fort from the South. To the South and the North of the fort, and outside of the ramparts, small basins have been found cut into the rock. It has been suggested that these were created to collect rain water. The nearest source being Saint Sunday's beck down in the valley below. Above. 1908 etching of the hill fort. In 1908, when the site was surveyed, the survey from which the etching above comes from, it was noted that at the East side of the summit of the fort (over the present day fence) two pits and three shallow depressions were seen. It was thought at the time that these could have been the remains of hut circles, one of which was noted to have been about 40 feet externally. This larger depression is quite possibly still visible on the latest aerial photos of the fort....shown below. Above. Aerial view of the fort. The fort is easilly accessable by following the footpath which runs parallel to the wall across the back of the Helm. However, the descent at the other side is very steep and has to be treated cautiously.